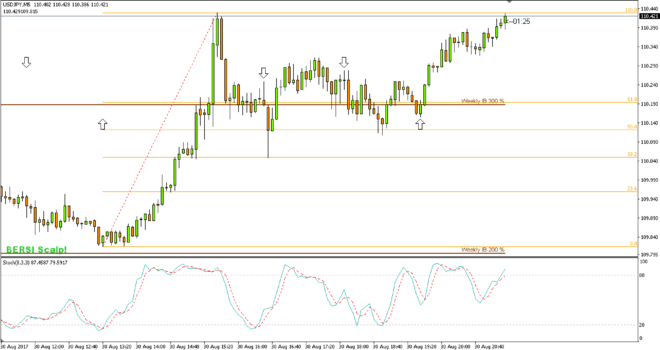 In our today’s article, we will be talking about an indicator used by and popular especially among the beginners. The popularity stems from being part of many strategies available at various websites, forums etc. Therefore it is easy for a beginner to get used to using it and follow it in spite of not knowing what its values actually mean. Would you like to know what indicator I am talking about? What values does it show? What do these values mean and how to use the indicator? Continue reading to learn more! This oscillator has been with us for a few decades. It was first described by George Lane in the 1950s. Stochastic indicator does not show the price of a given asset or the volume of trades made. It shows the speed of price changes. These changes are translated into figures on a scale from 0 to 100, and can be easily plotted in a chart. As mentioned above, the picture clearly shows that the values of the oscillator move i.e. “oscillate” between the values of 0 and 100. This is quite simple. But what do these values represent? When the line (the value of stochastic oscillator) is at the top (nearing 100, let’s say, 80+) this means that the asset is overbought. When the line is close to the bottom (below 20, let’s say), we may assume that the asset is oversold. We can either expect a trend reversal (…turning the overbought into oversold) or the opposite move – status quo for some period of time. As clearly shown in the picture below, both options may happen. As you can see from the above picture, both cases do happen. As soon as the oscillator falls below the 20 line (at the start of the Fibonacci lines) the price went up. An oversold asset has turned into an overbought, leading to an instant rise. After the first rise above 80, the values remained unchanged for pretty long and the buyers continued buying. Instead of going down, the price went even higher. This indicator can be used in two ways. You can use it as a tool for trade filtering. You can either trade with the trend (prices changes following the long-term trend) or in the opposite direction. This case shows how you can use the stochastic indicator to confirm signals. On the chart’s left side, you can see two arrows produced by the BERSI Scalp strategy. If you had used the stochastic oscillator as a filter, you would have avoided these two losses. In the middle of the picture you can see two vertical lines. The both mark the spot where the trend reversed. 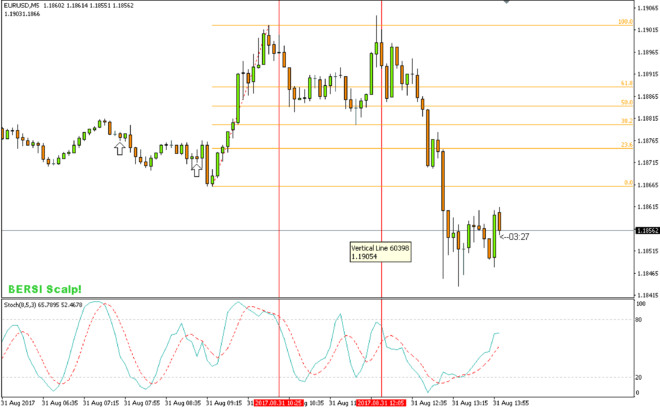 Using stochastic oscillator, you could have filtered and seen that the price would eventually go back down. How easy, isn’t it? In the second case, as you can see above, you can see the price once sharply go up and secondly plummet (both highlighted by vertical line). The stochastic indicator shows that in one case the price is oversold and in the second, overbought. There is nothing easier than to follow the trend of buying or selling traders. If you follow the current trend, you will surely profit. The signal in case 1 is even stronger because it was boosted by the BERSI Scalp arrow. I strongly recommend you to put Scholastic indicator in your arsenal. My personal recommendation is not to use the stochastic oscillator as the only signal for opening a trade. However I do recommend it for filtering. If you are about to open a trade, seeing some formation in the chart (or a signal in another strategy), you should first look what the stochastic indicator indicates. If the indicator does not confirm the move in your direction do not go for it. Instead, wait for a while for the next signal. Thanks to filtering you can separate the good and the bad signals only to trade when the signal is strong enough i.e. to confirm by multiple indicators. The stochastic indicator is not the only indicator one should use as a filter. 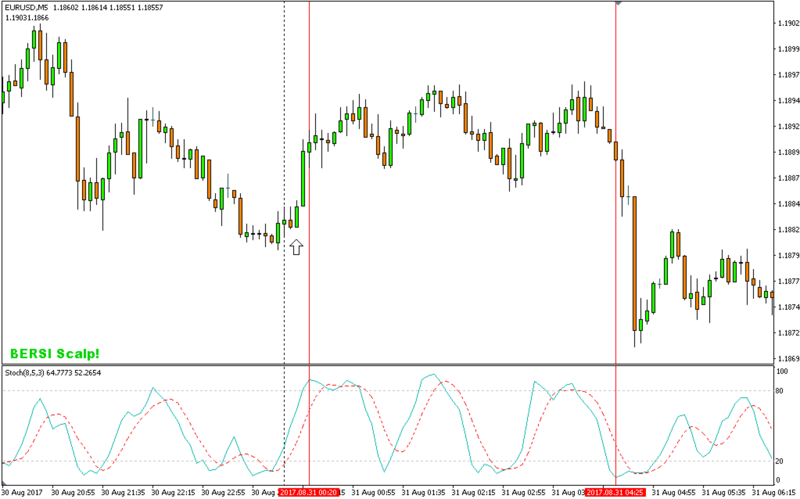 You can also use the ADX Indicator or RSI.